Whether you’re planning an addition for a growing family or simply getting new storm windows, finding a competent and reliable contractor is the first step to a successful and satisfying home improvement project. Ed’s Contracting is committed to providing quality service. Contact us today for your next home improvement need or commercial project. Maybe you would like to add on to your existing home or refinish an attic turning it into a wonderful family room. List your family's needs and habits, which reflect the way you live and spend leisure time. Think of how you like to entertain, and for how many people. Then let Ed’s Contracting design and build your deck, sunroom or room addition. Call us today to schedule your free estimate! Gutters are one of the most often forgotten maintenance areas of a home, yet are one of the most important. Faulty, overflowing gutters can lead to damaged insulation (lower energy efficiency), damaged structural lumber, termite infestations, excessive mold, and unhealthy landscaping. 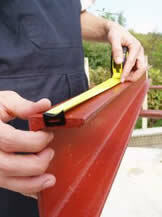 Ed’s Contracting can repair or replace your damaged gutters. We also clean your gutters as well. 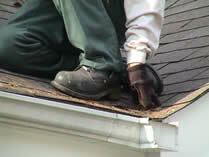 Most contractors use high-pressure sprays to clean gutter systems, which can damage your gutters. Ed’s Contracting inspects all gutters and downspouts and then removes debris by hand to ensure your gutters are left spotless and undamaged.